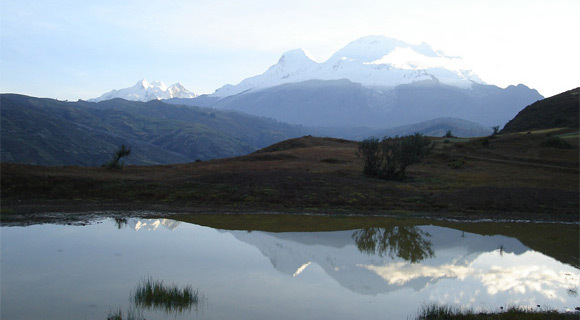 We are excited to announce our 2005 tour to Ancash Peru. We will be taking a group in August on a special AYNI tour. For a taste of the journey, please click on our 12 minute picture show that is accompanied by Tito's music from our 2004 trip. You can also view a pdf file with the itinerary and other details about the tour. Tito La Rosa, beloved Peruvian sound healer and musician of South America, and Elba Bravo, healer, teacher, and Director of CHAUPIN Andean Wisdom center returns to the Bay Area with "The Spirit of Ayni" Concerts, Healings & Workshops from September 29th through October 17th! For more than a decade, La Rosa, a descendent of Quechua Indians of the Peruvian Andes, has been recovering and preserving, studying, and intuiting the ancestral music of Peru. La Rosa has worked using Ancestral sounds for healing in a psychiatric institute in Peru. He and his wife and partner, Elba Bravo, have a sound healing center, using Ancestral instruments and rituals in Chaclacayo, Peru. Proceeds from their concerts, healings & workshops in the United States benefit their musical education program for disadvantaged indigenous children in Peru.